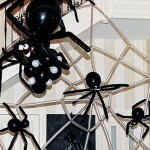 Why Halloween is the balloon holiday? Easy to see: Because of the spiders and webb! Both a so easy to make out of balloons! Good luck, have a great party!